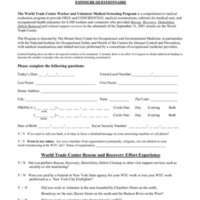 [html document, Mount Sinai School of Medicine Department of Community and Preventative Medicine, 2002] A checklist for avoiding exposures to the potentially hazardous the dust and soot released by the fires and collapse of the World Trade Towers. 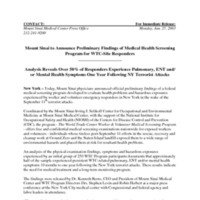 [pdf document, Mount Sinai School of Medicine Department of Community and Preventative Medicine, 2002] Flyer inviting workers and volunteers at the WTC site to use the Mt. Sinai medical screening and referral services. 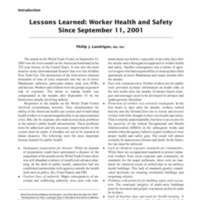 [html document, Mount Sinai School of Medicine Department of Community and Preventative Medicine, 2002] Facts about asbestos exposure from the WTC collapse. 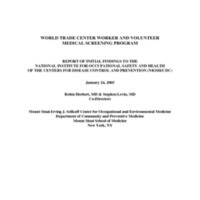 [pdf document, Mount Sinai School of Medicine Department of Community and Preventative Medicine, 2002] Questionaire about possibly hazardous exposures for the World Trade Center Worker and Volunteer Medical Screening Program. 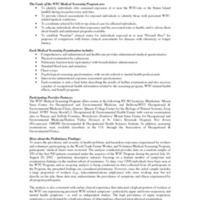 [html document, Mount Sinai School of Medicine Department of Community and Preventative Medicine, 2002] Describes the services offered and locations of this program. 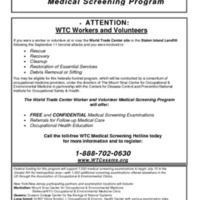 [html document, Mount Sinai School of Medicine Department of Community and Preventative Medicine, 2002] Flyer inviting workers and volunteers at the WTC site to use the Mt. Sinai medical screening and referral services. 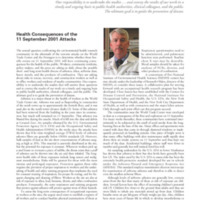 [html document, Mount Sinai School of Medicine Department of Community and Preventative Medicine, 2002] Questions and answers about health impacts of exposures to the dust and soot released by the fires and collapse of the World Trade Towers.